In the summertime, the streets of Fort Worth, Texas, shimmer with 100-plus-degree heat. And while Fort Worth is no West Texas – the city does get an average of 33 inches of rain a year – much of the foliage is unable to make it through the summer months without at least some crisping. In the midst of this climate, the Omni hotel is bravely forging ahead with a rooftop herb garden, specifically situated to remain verdant through the summer months. The 352-square-foot garden is home neat rows of about a dozen different types of herbs, which chefs at one of the hotel’s restaurants plan to incorporate into meals. This care includes watering the plants for about 15 minutes every three or four days. When the heat increases during the summer, the watering schedule will become more frequent, quenching plants’ thirst every two days. The garden will also benefit from its location on the East side of the building, where it will be shaded from the sun for most of the day by the hotel’s condo tower. “It does get the morning sun, but it doesn’t get any of the searing, afternoon West sun. That’s why we’ve planted a lot of indigenous plants here, too – the habaneros, the jalapeños, native plants that favor the heat,” said Larry Auth, the hotel’s area director of sales and marketing. The impetus for the garden came from the hotel’s original executive chef, Mike Jackson. “For the first 18 months, we were focused on trying to open a building, and now that we’ve done that and are established, we are able to focus on things like this garden,” Auth added. Jackson recently left for a job at Deloitte University, and never saw his leafy rooftop dream come to fruition. But when the herbs are ready in a few weeks, diners at the Omni’s Cast Iron restaurant will get a taste, as will frequenters of the poolside bar, where spearmint leaves will flavor the mojitos – something that Auth said he is pretty excited about. Auth also said he believes the garden will give the hotel a bit of an edge over its competitors. “It’s good for the environment, for one thing, but I think people want to have freshness. They expect it in their personal lives, and since people try to incorporate that in their day-to-day lives, I think it’s important that when people bring their clients here, they should be able to get that freshness here, too,” he said. 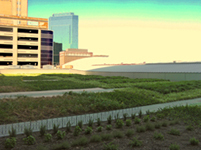 Want to see more pictures of the Omni’s rooftop garden? Check out our Facebook page.